Comes with Snapdragon 855 processor, 48-megapixel camera and 10x optical zoom. 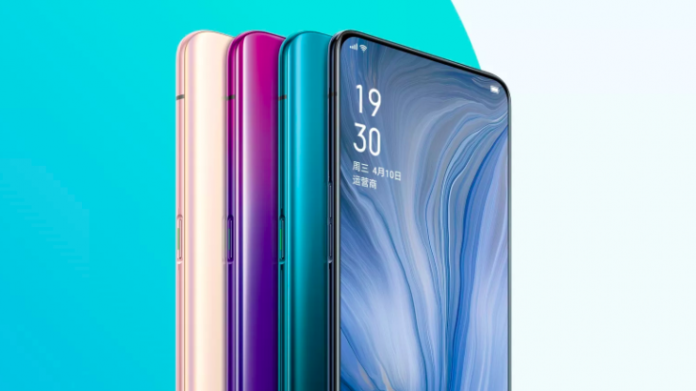 And of course there is not a "notch"
Oppo introduced today the latest flagship, the Reno model. It’s the first device of really-high-end hardware from last year’s Find X model. Comes with Snapdragon 855 processor, 48-megapixel camera and 10x optical zoom. And of course there is not a “notch”. Reno has an unusual “pop-up” selfie camera that enables the screen without “notch”. When Find X had a slide mechanism for the selfie camera, Reno has the “pop-up” mechanism in place of it. However, there is not enough room for 3D Face ID technology and instead, Reno has added the fingerprint scanner below the screen. The smartphone comes in four colors and two versions: Reno and Reno 10x Zoom Edition. The first has a 6.4-inch OLED screen, a Snapdragon 710 processor and a super-wide secondary camera, the second has a 6.6-inch screen, Snapdragon 855 and a 10x optical zoom with the third camera. Both phones have NFC and VOOC 3.0 fast charging technology. The standard Reno costs $450 for 6GB of RAM / 128GB of memory, $490 for 6GB of RAM / 256GB of memory and $540 for 8GB of RAM / 256GB of memory. The 10x Zoom Edition costs $600 for 6GB of RAM / 128GB of memory, $670 for 6GB of RAM / 256GB of memory and $710 for 8GB of RAM / 256GB of memory.